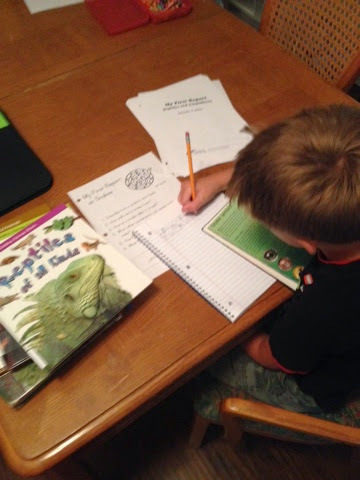 Through the Homeschool Review Crew, we were chosen to review Hewitt Homeschooling's My First Report: Reptiles and Amphibians. My First Report introduces children to the concept of a report through looking up facts and information in books, writing out their thoughts in full sentences, compiling and putting their information together, library and encyclopedia/dictionary skills, and more - all while still enjoying themselves and learning more about a subject they enjoy. There are over twenty four different topics for children in grades one through four. (Most are written for grades 3 and 4 but grades 1 and 2 can do them with parental help and they're great remedial work for grades 5 through 8.) The report comes in packet of around 50 pages. My son is getting ready to start third grade. When I read off the titles of the different reports to him, he immediately chose reptiles and amphibians first because he LOVES snakes! He can't get enough of them. We are getting ready to start school - next week in fact - so this was a good thing for us to start off to help get back into the groove of "back to school." (We're normally year rounders but took time off this summer.) Our Reptiles and Amphians report packet contained pages on lizards, iguanas, chameleons, turtles, crocodiles, snakes, garter snakes, rattlesnakes, frogs, toads, newts, and salamanders. If you study one topic per week, the packet can last an entire quarter - which is what we have been doing. Before we started the report, I read through all of the instructions that are included for the parent/teacher - it had lots of helpful hints on how to tie in other subjects and activities, field trips, Bible study, PE, music and more. It also included a very comprehensive book list so we then went and checked out a big stack of books from our local library about reptiles, amphibians, and some of the specific animals. We then dove into the report. He began with the page on snakes, of course. It had several different questions on it about snakes and their skin, their parenting, how they moved, etc. along with vocabulary words to look up. My son isn't a big fan of writing (we're working on it!) so when he got tired of writing, I let him answer aloud some of the questions and then wrote down his answers. He loved looking up the information and learning HOW to look up information - by using the index in the back of a book, finding correlating pages, and going in alphabetical order in the dictionary. 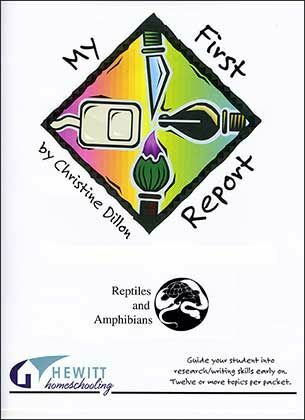 My First Report: Reptiles and Amphibians can be purchased through Hewitt Homeschooling for $8.95. Click the Schoolhouse Review Crew button below to read other Crew Member's reviews of My First Report, Lightning Literature, and more.